Norwegian angler Mathias and his companion made an early start fishing at IT Lake Monster in Thailand and chose to fish with deadbaits for the entire day. Large mackerel fillets were mounted onto Owner hooks with strong fluorocarbon hooklinks on the business and fished to various marginal spots along the nearside bank. After only a matter of minutes Mathias was straight into a fish which powered off towards the centre of the lake. A ten minute battle followed which saw the fish hugging the bottom on a series of powerful runs. On netting the fish it was observed to be a fat Amazonian Redtail Catfish of an estimated 25kg’s. After releasing the fish one of the other rods tore off as the anglers companion bent into a good sized fish. Another Redtail Catfish of a similar size soon graced the net and was released after photography. Mathias and his companion both continued to score well with the fish landing a succession of Redtail Catfish between 10-25kg’s. As the days fishing continued further species were landed with a good sized Barramundi and several Alligator Gar picking up the anglers baits. The afternoon saw another run of takes which saw Mathias landing a very small Arapaima of an estimated 10kg’s. The anglers enjoyed hectic action throughout the afternoon and added further Redtail Catfish to over 30kg’s in addition to Sorubim. 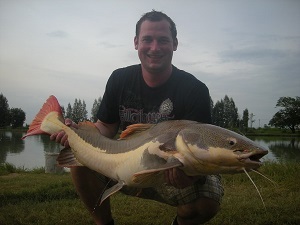 At the end of the days angling the Norwegian duo had landed over 35 fish with quality Redtail Catfish to over 30kg’s.